My thinking was that Black Lightning’s invitation to join the JLA in Justice League of America #173 was related to legacy in the sense that being associated with a popular superteam has had the effect of providing a platform for characters who have never had quite enough popularity to prop up their own solo title and spin-off characters. Take for example, Ant-Man and the Wasp, who were one half of the stories that once appeared in Tales to Astonish, but never really caught on until they were Avengers, becoming Marvel Comics mainstays. Even recent solo titles with different people using those heroic identities leverage that team-built legacy (with mixed success). While I lauded the idea of Black Lightning refusing to take part in the dominant institutions of the DC Universe and the ways they support unmarked white supremacist ideologies of both the setting and our real world, I also suggested that that refusal also guaranteed that Black Lightning would remain a marginalized and second-tier character, thus depriving him of a legacy on his own terms. But rather than write even more about Black Lightning, I decided instead to focus on the topic through a specific story that explores legacy in superhero books, by weaving it into the anxieties of parenthood (particularly fatherhood), their intersections with black identity, and the stereotype of the absent father. The absent father trope especially resonates in superhero legacy stories since, while many identities have passed down directly from parent to child, many other legacy relationships in superhero comics are stand-ins for blood relation and represents the creation of surrogate kinship bonds (think Batman and his ward, Robin). . . .an anthology comic. 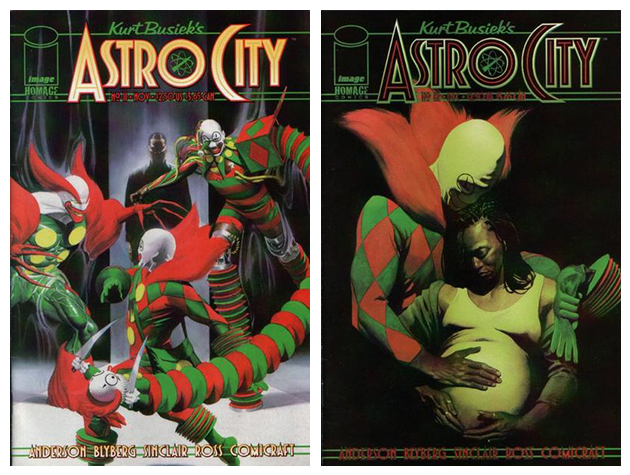 Rather than several individual titles focusing on individual characters and teams, the world of Astro City (named for the city in which most of its stories occur…) is the thread that binds it all together, with individual issues and arcs of varying lengths focusing on one character or a team of characters. These arcs riff off of tropes and stories that are familiar to superhero comics readers, providing a distinct perspective on those stories without ever mentioning them by name, nor being beholden to their expectations. Since this Jack-in-the-Box story does not need to be beholden to expectations, it can play with the genre and its tropes more freely than even the already meta-minded tendencies of superhero comics. Jack is Zachary Johnson, an engineer and toy designer who is actually the second man to take on the Jack-in-the-Box identity. We discover in issue #12 that Zachary’s father was the first Jack-in-the-Box, who in the 1960s invented the guise and its gadgets—like electro-shocking clown noses, binding silly-string, and accordion-like punching handsprings and jumping boots—in order to go after the mob-tied toy company that overworked, underpaid, and eventually fired him. As the narration explains, “They hired him and paid him half what less productive white designers made.” When he discovered that his toy designs were being re-purposed to make weapons for the underworld and tried to alert the authorities, he was dismissed, and had to become a superhero to rescue his own father, who was kidnapped as insurance against his efforts at justice. With this backstory, Busiek connects the framework of the superhero origin story to the marginalization of the black community and their unequal access to civil and economic justice, but the story in the “present day” (now 20 years past from our perspective) uses the superhero lineage to address the limitations reinforced by racism in contemporary American society. Zachary Johnson is more successful than his father ever was. When we’re introduced to him he is running his own toy business and is married to a local TV anchorwoman, Tamra Dixon. Zachary wasn’t forced to adopt the Jack-in-the-Box identity, nor was it directly passed down to him. He didn’t know his father was the original Jack-in-the-Box until he was 18-years old and discovered his dad’s old gear when in the process of settling the estate after his mother died. His father—Jack Johnson—had disappeared six years before when Zachary was 12, as he was killed fighting a supervillain. Even before the elder Johnson died, his alter ego kept him frequently absent, so like too many young African American men, Zachary grew up without a father around. 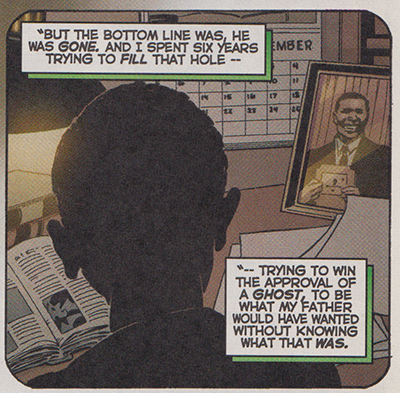 Becoming Jack-in-the-Box was Zachary’s way of feeling connected to his absent father, and honoring him, despite simultaneously feeling some bitterness that “[his] father had cared more about fighting crime than about his family.” The prospect of starting his own family is burdened by this history, but there is a simultaneous history that burdens the events in these comics, the excesses of 90s comics themselves. We only learn the Jack-in-the-Box backstory after the events of issue #11, in which two murderous future versions of Jack-in-the-Box, both claiming to be Zachary’s son, arrive in the present to confront their sire. One of them is “The Box,” who like his own father grew up not knowing his father’s identity, but upon discovering the truth had himself surgically altered into a cyborg clown, with a pop-out eye, and one arm like a clown sock-puppet armed with a variety of murderous props—from steak knives to a flame-thrower to a working chainsaw! The other is “the Jackson,” who, unlike his cross-time cyborg sibling, is more a feral creature, like a clownish Sabretooth. 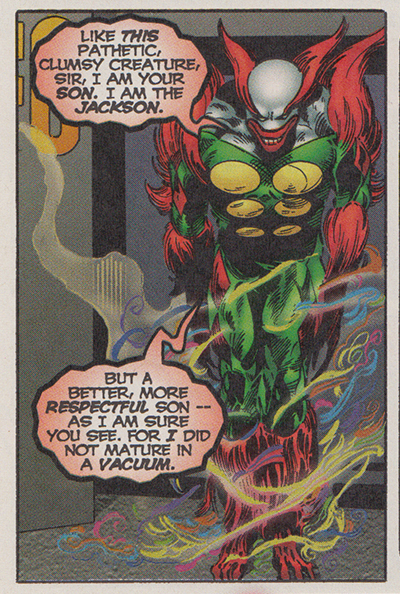 Riffing off tropes common to Marvel’s X-books of the 90s, the Jackson was raised in a dark future by a group of monks called The Brothers of Trouble. Jackson also grew up without knowing his father, and while at first, the two versions of Jack-in-the-Box’s legacy are at odds, the possible future sons quickly team up to kill their own father, when he does not live up to their expectations. They are obsessed with establishing themselves in relation to their imagined legacy. As such, the degree to which Jack-in-the-Box still represents the traditional superhero of the Silver or early Bronze Age, as opposed to the absurd grimdark grit of whatever imagined comic book we can envision them being from, is a betrayal of their self-seriousness. Simultaneously, they are blind to how their own clownish appearance mocks that seriousness. It seems clear to me that through these dark figures Astro City is directly commenting on its superhero comic book contemporaries of the 1990s. The Cable reference is very clear, but in Brent Anderson and Will Blyberg’s art, we can see how the two characters from the future are rendered to evoke the excesses of 1990s comics. Everything about them is violent and extreme, from Box’s puppet chainsaw, to Jackson’s Venom-like mouth, Sabretooth claws, and puffed up upper body. In other words, the story in these two comics are also evincing an anxiety with the dark legacy of the genre itself. The very first thing we see the Box do is execute a small-time crook. Later, the Jackson quotes Jack-in-the-Box back as if from religious scripture, “Of course you realize, this means war!” But Jack objects, claiming he had been only quoting Bugs Bunny. It was a joke, not a philosophy. What had been done in good fun was twisted to dark absurdity through the kind of exegesis that constantly threatens to swallow Big Two comics whole. The brilliance of this story is how it operates on three levels: fatherhood, superhero legacies, and the meta-level of the genre itself. 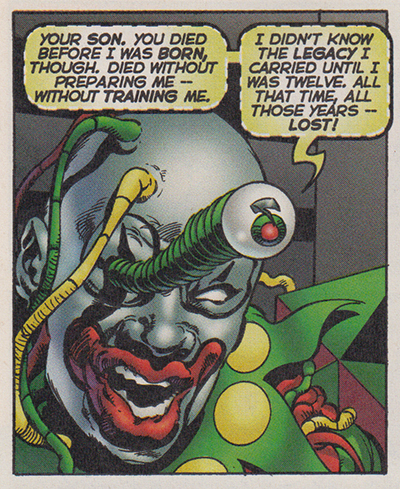 It suggests a limited power on the part of the progenitor to control the outcome of their work, while also depicting Jack-in-the-Box working to shape his legacy in the most direct way he can, immediately trying to break the cycle of absenteeism that his time-traveling sons represent. The inability to shape a future exactly as we would like, however, also means that the possibilities of the dark futures common to superhero comics (especially in the decade and a half after the seminal X-Men time-travel story “Days of Future Past”) are avoidable. The multiple sons represent an unfixed future. After his first encounter with his would-be sons, Jack-in-the-Box expresses relief that he doesn’t have any children. The concluding twist of Astro City #11, however, immediately undermines this relief as Zachary’s wife announces she is pregnant—only his need to attend to the supervillianous interlopers kept her from telling him earlier. In issue #12, however, Jack-in-the-Box runs into a third possible future son. This son, Jerome Johnson, is a college professor, a researcher specializing in “chronal flow.” He also traveled back in time to meet the father he never knew. Jack can’t know what determines which of the three versions come to fruition, but the few moments with Jerome make it clear that Jack has little time before whatever choices are made that lead to one of the three outcomes (or perhaps some others he’ll never know about). This creates a sense of urgency as the narrative continues and Tamra’s belly grows. Legacy is closely tied to mortality and birth. Through alternative modes of kinship, Busiek’s story unties that knot.. While there is some imperative to pass on some genetic legacy in the form of offspring, the cultural imperative to pass on values and a sense of history is a stronger and more meaningful one. This latter imperative also allows for the disconnecting of kinship from the accident of biology. These kinds of kinship bonds are seen all over superhero comics. Ramzi Fawaz writes about them in regard to the Fantastic Four and X-Men in his book The New Mutants: Superheroes and the Radical Imagination of American Comics, and they are the foundation of the Bat Family over at DC Comics, for example. Race, of course, complicates and troubles notions of legacy characters. Since the days of Mal Duncan’s few moments as Guardian in Teen Titans and Jon Stewart becoming a Green Lantern, there have been black legacy characters adopting identities originally associated with white characters. More recently characters of color like Miles Morales and Kamala Khan having taken up superhero identities that were held (or are still held) by whites. Cross-racial legacies, however, run afoul of the effective immortality of superhero characters. It undermines the ability for the newcomer to actually take ownership of that legacy. Even when characters do appear to die or lose their powers, their inevitable return leads to a multi-modal crisis of identity. Within comics fandom, there exists a retrograde percentage of readers who refuse to accept queer, black or brown, and/or female versions of the characters and give a hue and cry about tradition, despite how the white supremacist underpinning of much of popular culture assures the old white versions—especially when they are part of highly recognizable multi-million-dollar franchises—will return to confuse things or, even worse, simply take the identity back. Meanwhile those readers excited to see themselves represented in their favorite genre eventually feel the bitter disappointment of cancellations or wild mischaracterization by less sensitive writers. In such cases, the capitalist market for popular entertainment and white supremacy are indistinguishable. Consider Sam Wilson—formerly the Falcon—becoming Captain America. All signs point to the fact that Steve Rogers will soon be back in the red, white and blue tights, despite his Nazi turn in the Secret Empire. Sam will go back to being the Falcon. What does that mean for Joaquin Torres, the young DREAMer who currently uses the Falcon identity? My guess is obscurity. There are fewer examples of non-white superhero legacies within race. The White Tiger identity has been passed around a bit, mostly among the same family, though one iteration was literally a white tiger evolved into a human being, who somehow knew kung fu. The Power Man identity was passed from Luke Cage to Afro-Dominican Victor Alvarez, though it was Iron Fist that served as Victor’s mentor, not Luke. Over at DC Comics, Black Lightning has two super-powered daughters, Thunder and Lightning (but I don’t know much about them). Steel also has a niece, Natasha Irons, who has taken the identity in the past. The troubling issue, however, is the degree to which the legacy tradition reinforces problematic interchangeability when it comes to characters of color. Consider the fate of Black Goliath. He was plucked from relative obscurity by Mark Millar to serve as a sacrificial lamb in 2005’s Civil War event, and then replaced by his nephew, who was not markedly different in any significant way. The case of Native brothers John and James Proudstar might be even worse. 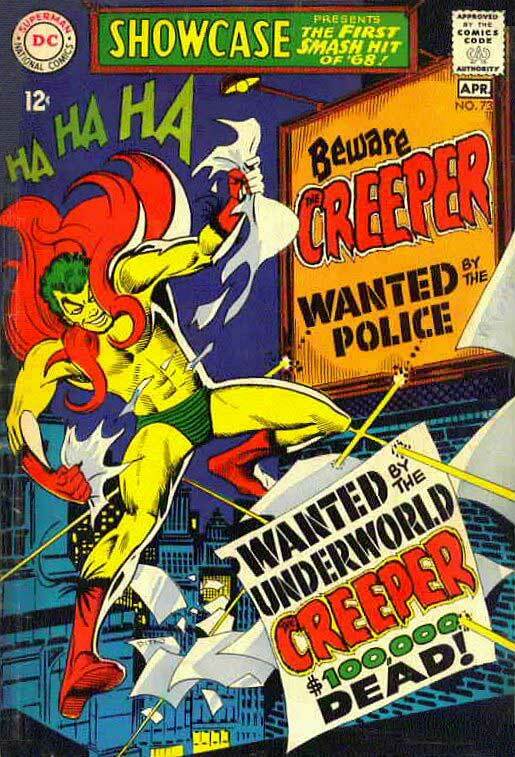 One was killed in 1975, and when his younger brother showed up in 1984, he had the same powers, costume and name (later changing it to the cringe-inducing Warpath). And yet in Astro City it is the interchangeability of civilian identities obscured by the superhero persona that Zachary Johnson relies on to break the cycle he fears. Similar to the way we can sometimes read the invisibility of Peter Parker’s whiteness under his Spider-Man costume as contributing to his oft-times marginalized place in the superhero culture of the classic Marvel setting, Jack-in-the-Box, with his mask emulating the bone-white face paint of a clown is able to pass within the superhero world without his race being an explicit issue. Of course, this does not wholly erase his experience of race, (Consider, for example, the scene I wrote about in “Four-Color Color-Blindness” involving James Rhodes and Reed Richards). Busiek’s Astro City, however, like the superhero tradition it is built on, only addresses race when convenient to its storytelling, but otherwise mostly ignores it. Take Astro City vol. 1, #3 (1985). In it a small-time crook called “Eyes” Einstein, happens to glimpse Jack-in-the-Box changing out of his costume on a rooftop and expresses no surprise that the hero is black. He doesn’t comment on the obvious fact that Jack’s race vastly increases his chance to identify the hero, given the yuppie neighborhood the encounter happens in. (There is a whole other post about that story that might need to be written one day). The mask and full-body costume of the superhero milieu allows for Jack to pass on his identity without anyone knowing that the individual within has changed. There is a fourth son in this two-issue story, Roscoe James. Roscoe is not Zachary Johnson’s biological son, but he is the leader of the Trouble Boys, a local “gang” of African-American youths from Bakersville’s (Astro City’s historically black neighborhood). They emulate Jack-in-the-Box’s gymnastic antics, try to keep up with him on rooftops, and occasionally providing the hero with some help. Think of them as the 90s equivalent of Simon and Kirby’s Newsboy Legion viewed through the lens of Boyz in the Hood. Roscoe and his homies show up a few times in the two issues, but at one point upon leaving the police station where Box and Jackson are being held, Jack-in-the-Box finds Roscoe being brought in as a suspect for a crime he could not have committed. Jack vouches for Roscoe, but Roscoe is not feeling very grateful. Jack is confused by his attitude. Ugh. I have to stop here for a moment and just express how much Roscoe’s dialog makes me cringe. As interesting and layered as this story might be, the dialog for this black kid is atrocious. Busiek fails miserably in emulating anything remotely sounding like African-American Vernacular Expression, but rather just makes the poor kid sound like a stereotype. This is not because of what black American dialect actually sounds like, but because it is written without a sense of the dialect’s rules and patterns. This is especially the case in comparison to the clearly articulated so-called “standard” English of Zachary’s future son, Jerome. Anyway, the encounter with his future sons and Roscoe’s expression of despondency is what shifts Jack-in-the-Box’s thinking. There is some element of a bougie bubble in Zachary Johnson’s outlook. He owns his own business. He is married to a high-profile newscaster. According to Astro City #3 he lives in a yuppified and gentrifying neighborhood. This might account for his apparent cluelessness and patronizing attitude about Roscoe and the Trouble Boys, not being able to quite see things from their perspective, despite being sympathetic to their position. What Jack-in-the-Box comes to realize is that our inability to define our legacy can be mitigated somewhat through the creation of kinship bonds across bloodlines, as opposed to along them. By recruiting Roscoe to be the new Jack-in-the-Box, Zachary is not only avoiding his own fate to die and leave his child fatherless, but also addressing that very circumstance in Roscoe’s life, and helping him to avoid the troubling legacy that has defined so much of African-American life in the sociological imagination. 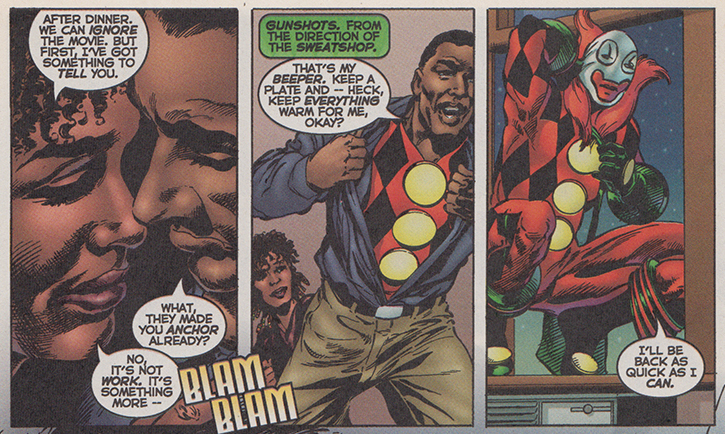 The figure of the African-American family is not a common one in American superhero comics. There are a few exceptions, but typically the non-familial kinship bonds that constitute the notion of legacy in such comics happen within an unmarked white identity, or across-race in narratives meant to ennoble integration and depict white superheroes as generous and progressive. It is important that black solidarity be represented in the genre, even if the individualistic approach of the superhero, whether it be stopping a bank robbery or adopting one kid off the street, does not act as a magic wand to fix the structural problems that lead to kids like Roscoe having limited choices in the first place. Within the context of trying to change the dreaded future of Box and Jackson and tropes of predestination that trouble time-travel stories, Zachary Johnson knows the choices he is making could be the very things that lead to one of those futures or even a worse one, but when he explains, “But it’s the best I can think of, and in the end – isn’t that how it works for any parent?” the comment echoes against not only the legacy of the superhero comics genre, but also with anyone’s actions in light of the greater ideological structures of oppression and marginalization. Taken together “Serpent’s Teeth” (in Astro City #11) and “Father’s Day” (in Astro City #12) are a thoughtful examination of the complexities and resultant anxieties of legacies through the use of one of superhero comics’ greatest strengths, its own genre flexibility to address both social concerns and family drama. All that being said, there are still aspects of the story that trouble me. As much as I love what is layered in this story, re-reading it, I could not help but feel like it falls into some traps that does its subject a disservice. I already mentioned Roscoe’s dialog, but Tamra’s characterization needs some help, too. Clearly, this is meant to be Jack-in-the-Box’s story, but for a comic book that often takes the perspective of the “everyman,” it seems like a lost opportunity to get the perspective of a black woman. In fact, Tamra seems oddly ancillary to the array of choices in the story given what is at stake for her and her child. Yes, the story evokes a tension that emerges from the conflicting emotions at play—the joy of a coming child, the fear of the future, the feeling of duty, the inevitable disappointments of any human relationship—but the point of view leaves Tamra the hollow figure of the hero’s wife. The narration even cops out by having Jack say, “Tamra doesn’t want to interfere – she’s always stayed out of my choices as Jack,” laid over panels of their dinners and a trip to the obstetrician, which make it clear his choices as Jack affect her directly, even as it suggests his feelings and choices have priority. She should have some say. The two-part story might have been even more nuanced and complex if it had figured out a way to shift the point of view from Zachary to Tamra between issues. At the very least, even if Zachary Johnson was clueless about the emotional toll on his wife (which he clearly isn’t) Busiek and Anderson needed to do something to make note of her agency, and challenge her secondary position in light of patrilineal expectations. And that is the other issue I want to bring up, perhaps too briefly. The focus on the absentee father feels a little too grounded in a Moynihan Report style take on the disintegration of the African American family, and the supposed destructive vein in “ghetto culture” that erases not only the work of black women, but myriad ways families are organized that do not adhere to normative ideas of the nuclear family, thus reinforcing the toxic supremacy of patriarchy. Such a focus also lets social and economic conditions off the hook, by re-codifying now verboten ideas of biological inferiority in terms of cultural inferiority. As the very title of Hortense Spillers’s seminal work (and scathing critique of the Moynihan Report) “Mama’s Baby, Papa’s Maybe” suggests of the situation explored in these two comics, Tamra’s duty to her child goes unquestioned, while the very question of how Zachary will react to and handle his paternity remains up in the air. The white patriarchal narrative of family connects “legitimacy” to fatherhood and its agency, while ignoring how that very structure has endeavored to undermine the choices of black people, and discounted as pathological the ways in which black women have historically sought to compensate for this burden. Tamra’s loving meekness risks coming off as the antidote to the overbearing overcompensating role of black women in the African-American family that Moynihan contends pushed men away. At the end, Zachary chooses to “adopt” Roscoe without consulting Tamra, essentially using his paternal power to choose a son for her, without considering the labor, both physical and emotional, that such a decision asks of her. Zachary Johnson’s story is a bootstraps story, and unchallenged bootstrap stories are dangerous. They inevitably erase every single other person who has aided in ways big and small to lift that person up. Perhaps the moral that these comics could demonstrate a bit more explicitly, is the limit of our personal choices to overcome the circumstances around us, but how working in solidarity with others who are vulnerable can empower those choices by creating strong multivalent networks of support. Legacy, regardless of the fictions used to prop up its notions, is never the province of any singular individual asserting their agency, but the work of families, however we might come to define them. Excellent article. Astro City is one of my favorite series and I love reading other’s thoughts about it. I don’t know if you’re reading the current run, but in case you’re curious #35 & #36 feature Zachary & Tamra’s son Ike as the protagonist. I stopped pretty early on, but have been considering picking up what I missed. I will definitely look for these two issues. Thanks! Oh and thanks for commenting with kind words. Come on back, any time. Great as always. One thing I would add is that this story’s brilliance includes a fourth level – it absolutely works as a straightforward narrative, with tension and choice and an earned ending. It would be easy for Astro City to be dry essays of meta-commentary and subtext, but it’s extremely entertaining on the surface. 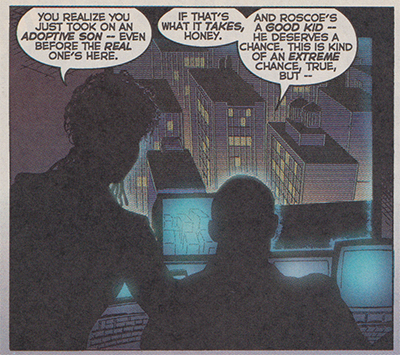 Good points about the ways Busiek, Anderson, and Ross do fail – the other marginalized woman here is Zachary’s mother, who remains a nearly unacknowledged cipher despite raising him for eighteen years, and whose primary narrative function is to die (cause unmentioned) so that Zachary can come of age in a heroically tragic way. Yes, I think you are right, that when Astro City is at its best, it also provides enjoyable stories – though sometimes (and I find this especially true of what I have read of the current series) it feels a bit too breezy as a result of trying to quickly provide the necessary exposition to lay the story’s foundation. As for Zachary’s mother, I agree. In an earlier draft I mentioned this, but somehow that ended up cut in trying to keep the post from getting too long. I thought the story said she died of cancer, but I don’t recall. And that’s about all we get about the woman who brought Zach through his adolescence into overachieving Matt Murdock level physical/mental/educational/financial perfection. Ah. Thanks for going back and looking. You are 100% correct. (the cancer thing must have been my own brain trying to make sense of it). This issue is exacerbated by the more recent Jack-in-the-Box story in issues #35 and #36 (of the current volume) that a reader mentioned above (and that I just got my hands on), that again mostly focuses on legacy as a patrilineal phenomenon. Zachary’s wife is reduced to the simple “worried mother” and a parallel villain legacy also kills off the mother. It’s particularly unfortunate that women are so absent from both the Taylor and Williams stories because Astro City has so many great women, mostly white or written without any reference to race (e.g. S Siezmanski and Raitha McCann, the Silver Adept’s assistant). This is my regular Disqus handle, most of my comments are on The AV Club and The Mary Sue, I’ve also had a few things to say over at X-Plain the X-Men. Much of my apparent expertise is just using the Google – I wouldn’t have been able to provide last names for Siezmanski or McCann without that, I just remembered their stories and how they fit the pattern of POC coded as white. I’m usually better at responding than coming up with anything like a blog post, so if there’s a particular subject or angle you think themiddlespaces needs, I’d be very open to that. One thing I couldn’t do is talk about comics being published this month or as part of big events still being resolved, I’m very happy to stay way behind the times and around the margins, I haven’t subscribed to floppies since the eighties and don’t Comixology or Unlimited, I like physical collections of stuff after it’s done. As you might be able to tell from the site, I tend to write about old stuff. I don’t worry about what is up to the minute so much around here, and write about wherever my comic book hunts (for physical issues, I also don’t do digital) take me. I’ve been considering returning to the recent Winged Victory arc near the beginning of the current Astro City volume, but if you have something to say about it, I’d be open to a pitch. Or anything else you might be reading and have thoughts about. Also, no pressure to write, if you don’t want to. You’re always welcome to comment (which I wish we had more of around here). How’d you find the blog, btw? Jay and Miles? Twitter? I think I found you doing a Google search for Astro City, just looking for someone writing about it. For Winged Victory, I keep coming back to the inescapable parallels between WV vs, Karnazon and Clinton vs. Trump – it’s a coincidence, it was written in 2014, but there’s a federal investigation of WV’s e-mail server, crowds literally chanting “Lock her up!”, and an orange villain with pseudo-Teutonic henchmen… the trouble is that after noting how bizarre and cathartic all the similarities and differences are and playing games like “If Samaritan is Bill, does that make the Confessor Bernie?” there’s no substance because it’s not really about the text any more. I think Astro City is the right comic for me to write about now, it’s still not nearly as well known as it deserves and as movies and television make an ever widening audience for sincere interest in superhero comics, it’s always going to be a stellar example of what is possible. I’ll reread and get back to you. Email me at: themiddlespaces AT gmail.com when you want to toss something past me. Will do. Thanks again for the invitation, I love your writing here – not just on Astro City, although that seems to bring out my chattiest self.